First of all, HAPPY NEW YEAR, friends! And now, concerning OPFOR rank insignia. Having all FM 30-100 and FM 7-100 manuals, I found no trace of information concerning OPFOR rank insignia. And I wouldn't say that Internet is overloaded with such information as well. Nevertheless, I could dig out something, and as usual each new answer bears two new questions . First of all, there are only two OPFOR rank insignia charts in the whole web - on Uniforminsignia and another one I found here - http://www.usmilitariaforum.com/forums/ ... -headgear/. And I wonder which rank these insignia were of. Another question - the shoulder slips color. One source says that red color means motorized rifle units, black - armored, green - field subdued. Another source claims red meant the Soviet army, black - the Soviet Navy, and green - the Russian Federation armed forces. No fusiliers, no airborne? And what really the slips color meant? Why "blue" is "tank" and not, for example, airborne? Mates, all pre-OPFOR rank insignias are on Uniforminsignia already - I have all these Field Manuals (FM30-100 and others). 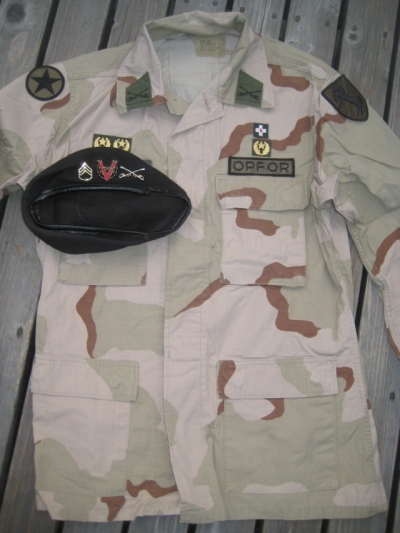 Actually, I meant OPFOR rank insignia starting from 1973 (or 1978) and up to now. Dorward_Bis wrote: Mates, all pre-OPFOR rank insignias are on Uniforminsignia already - I have all these Field Manuals (FM30-100 and others). based on some pictures I've seen, it would appear to have been the soviet inspired ones until the early 90s and afterward, US ones (at least for NCOs, look at beret below and right pocket) or none for cases were exercises involved "insurgents" or paramilitaries. Yes, looks like during the Cold War after as OPFOR replaced the Aggressor Army the maneuver enemy's insignia were Soviet-like for a certain period of time, but, as I guess they were not officially legalized by any document - at least Steven Bingaman mentioned that they were more like playacting, the system could be changed to fit whatever situation that the force is portraying. This is my version of the OPFOR insignia which should be inspired by the Soviet ranking system. by the way, i have a single picture of an Aggressor sailor (date unknown) but it's impossible to make the insignias. i know the early field manuals do not go into details regarding their uniform, did the later give any details ? marcpasquin wrote: by the way, i have a single picture of an Aggressor sailor (date unknown) but it's impossible to make the insignias. i know the early field manuals do not go into details regarding their uniform, did the later give any details ? Should have posted previously but this is the image in question (bottom right). Origin is unknown. by blowing up the picture, their insignias appear to match those you identified in the encyclopedia as having been worn between 1962-1973. Since both the aggressor air force and army (as well the real world soviet forces' branches) wear the same insignias, it is possible that the aggressor navy was supposed to do to. If you look closely, the shoulder slides of the other soldiers appear to be of a slightly yellower/paler green then their uniform. On the sailor, the collar tabs appear to be of the same colour so that it might have been used for their branch colour (like blue for air-related units). Yes, Marc, I meant the same picture - the only one with the indication of an Aggressor seaman. Concerning the Soviet-based Aggressor's system: in that period the Soviet Army was not indicated as a maneuver enemy so obviously as it was a bit later, after as OPFOR replaced the Aggressor. Moreover, according to the history of the Circle Trigon Party's Republic, the main purpose to have strong Aggressor's armed forces was the menace of consolidation of USA, UK and USSR (!) against the Republic of Aggressor. Sounds funny, of course, but not funnier than the fact that one of three key persons of the Republic of Aggressor was... Martin Borman (!). But all this was just a virtual history, necessary to create some background for the decent maneuver enemy. 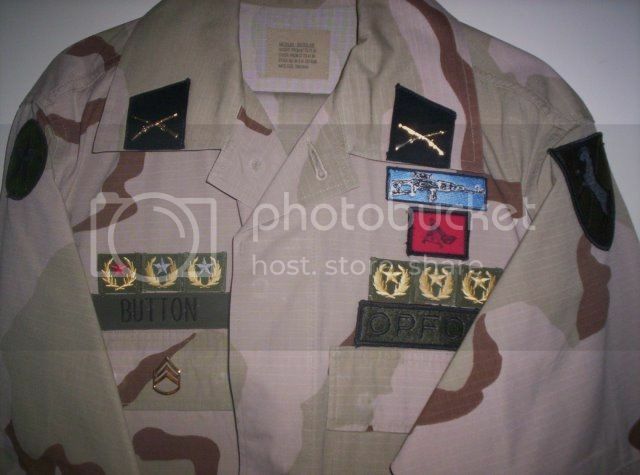 Therefore, the Aggressor Naval ranking system could either coincide with Army/Air Force, or could be different (even having same rank insignia, as you know, the Soviet Navy had some specific ranks like "starshina 2 stat'i" (petty officer 2nd class) or "kapitan III ranga" (Captain 3rd Rank). I've made some pictures of Aggressor's generic uniforms for various periods. There is a "misprint" in dates for pictures # 5 and 6: must be April 1962-1973. Some sources demonstrate another type of a uniform tunic (gymnastyorka) since 1961. I suppose, both patterns could be used by the Aggressor Armed Forces. There was also an insignia for generals, and if I remember correctly it was along the same vein with a larger pentagon. I have no idea if the rank equivalency here is correct; I was stationed at Fort Campbell when I read the book so it is certainly possible someone in the 101st compiled the information and made up or used some heavy conjecture to develop the handbook. Maybe one of our esteemed colleagues might find a copy. Regardless, the focus on asymmetric warfare has almost eclipsed the use of OPFOR insignia...almost. Caim_Dubh, thanks a lot for such an invaluable information! The only difference of this chart with your description is that the Junior Lieutenant on the chart should be renamed as a WO/CWO. General of the Army - 4 large pentagons. And (if the mentioned above is correct) I wonder if they had just these pentagons on their shoulder loops or with thick vertical stripes as for field officers? Anyway, thanks a lot again, and I would be incredibly thankful for any additionl information concerning this topic. So I'm not sure about the ranks about LTC. I've never actually seen anyone wearing anything higher than LTC OPFOR rank when I've been down at Ft. Polk the last few years. I also think that they may have done away with the rank slides with different branch colors on them. The OPFOR at Ft. Polk wears an all green uniform, the ranks slides are green with black stitching. The only branch distinction seems to be on their collar. They will wear branch insignia there. Some of the branches have a soviet style insignia (infantry), others simply use US branch insignia (Quartermaster, ordnance, etc...). This picture shows the Battalion Commander and the Battalion CSM uncasing a guidon and you can see the various insignia they currently wear.